The F train is one of 17 subway lines slated for service changes this weekend. MIDTOWN — Seventeen subway lines are slated for service disruptions this weekend as the MTA continues fixing stations, rails and signals. 1 Train: Uptown trains will run express from 42nd Street to 72nd Street from 11:45 p.m. Friday to 5 a.m. Monday. 2 and 3 Trains: 2 and 3 trains will be completely suspended in Brooklyn due to tunnel reconstruction from 11:45 p.m. Friday to 5 a.m. Monday. In Brooklyn, 4 trains will run local to Crown Heights-Utica Avenue to replace the 3 train. 5 trains will be extended to Flatbush Avenue-Brooklyn College to replace the 2 train service. 4 and 5 trains will run local in Brooklyn. Service won’t be available at the Clark or Hoyt Street stops. As an alternative, use Borough Hall or Nevins Street. Transfer at Barclays for N, Q and R trains to Manhattan. In Manhattan, Downtown 2 and 3 trains will be rerouted. 2 trains will run between The Bronx and South Ferry, making local stops between Penn Station and South Ferry. 3 trains will run between 148th Street and 14th Street. There will be no service at the Park Place or Wall Street stops. Use Brooklyn Bridge-City Hall and the Wall Street 4-5 stop instead. A free out-of-system transfer will be available between the South Ferry 1-2 and Bowling Green 4-5. Transfer between the South Ferry 1-2 and R at Whitehall Street. Downtown trains will also run local from 96th Street to 42nd Street from 12:01 a.m. Saturday to 5 a.m. Monday. Uptown 2 trains will run express from 42nd Street to 72nd Street from 11:45 p.m. Friday to 5 a.m. Monday. Service will operate between South Ferry and East 180th Street. Uptown trains will also run express from Third Avenue-149th Street to East 180th street from 3:45 a.m. Saturday to 10 p.m. Sunday. 4 Train: Trains will be suspended in both directions between Utica Avenue and New Lots Avenue from 11:30 p.m. Friday to 5 a.m. Monday. Free shuttle buses will make all station stops between the two. Transfer between 4 trains and shuttle buses at Utica Avenue. Manhattan-bound trains will skip 176th Street, Mount Eden, 170th Street, 167th Street and 161st Street from 5:45 a.m. to 6 p.m. Saturday and Sunday. From 7:30 a.m. to 7 p.m. Saturday and from 9:30 a.m. to 7 p.m. Sunday, the last stop on some Woodlawn-bound trains will be 125th Street because of track replacement. 4 trains will operate every 16 minutes between 125th Street and Woodlawn. 5 Trains: Service will run between Flatbush Avenue -Brooklyn College and Wakefield-241st Street from 11:45 p.m. Friday to 5 a.m. Monday. Free shuttle buses will provide service between East 180th Street and Eastchester-Dyre Avenue. Uptown trains will run express from Third Avenue-149th Street to East 180th street from 3:45 a.m. Saturday to 10 p.m. Sunday. 6 Train: Service will be suspended in both directions between Pelham Bay Park and Parkchester from 3:45 a.m. Saturday to 10 p.m. Sunday. Free shuttle buses will provide alternate service. 7 Train: Flushing-bound trains will run express from Queensboro Plaza to Mets-Willets Point from 3:45 a.m. to 10 p.m. Saturday and Sunday. A Train: Trains will run local in both directions between Euclid Avenue and Hoyt-Schermerhorn Streets from 12:01 a.m. Saturday to 5 a.m. Monday. Uptown trains will run express from Canal Street to 59th Street-Columbus Circle from 11:45 p.m. Firday to 5 a.m. Monday. C Train: Uptown trains will run express from Canal Street to 59th Street-Columbus Circle from 11:45 p.m. Firday to 5 a.m. Monday. E Train: Uptown trains will skip Spring and 23rd streets from 11:45 p.m. Friday to 5 a.m. Monday. 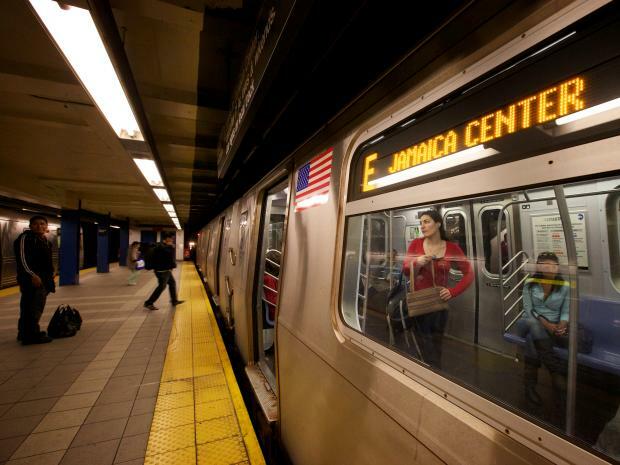 Jamaica-bound trains will run local from Queens Plaza to 71st Avenue from 12:01 a.m. Saturday to 5 a.m. Monday. D Train: Until later this fall, D trains will skip Prospect Avenue both ways. For service to/from this stop, use trains at the 4th Avenue-Ninth Street stop or the 25th Street R stations via the B37 and B63 local buses due to station enhancements. Trains will run express in Brooklyn from 36th Street to Atlantic Avenue-Barclays Center from 11:45 p.m. to 6 a.m. Friday. F Train: Until early 2018, Manhattan-bound F trains will skip Avenue U, Avenue P, Avenue N, Bay Parkway and Avenue I due to station work. For service to these stops, take a Manhattan-bound F to Kings Highway or 18th Avenue and transfer to a Coney Island-bound train. For service from these stops, take a Coney Island-bound F to Kings Highway or Avenue X and transfer to a Manhattan-bound F train. Uptown trains will skip 14th Street and 23rd Street from 11:45 p.m. Friday to 5 a.m. Monday. J Train: Until later this fall, Manhattan-bound J trains will skip Queens stops at 121st and 104th streets. For service to these stops, use 111th Street or Woodhaven Boulevard or take a Manhattan-bound J to 111th or Woodhaven Boulevard and transfer back. For service from these stops, use 111th or Woodhaven or take the Q56 bus and transfer to/from J trains at 111th. M Train: Until the spring, service will be suspended between Myrtle-Broadway and Myrtle-Wyckoff. M trains will run in two segments: Between Delancey-Essex Street and Myrtle Avenue and via the J to/from Broadway Junction; and between Metropolitan and Myrtle-Wyckoff avenues. From 6:30 a.m. to midnight Saturday and Sunday, trains will run to/from Chambers Street because of signal improvements. N Train: Coney Island-bound trains will skip Fort Hamilton Parkway, New Utrecht Avenue, 18th Avenue, 20th Avenue, Kings Highway, Avenue U and 86th St.
For service to these stations, take a Coney Island-bound train to Bay Parkway or Coney Island and transfer to a Manhattan-bound train. For service from these stations, take a Manhattan-bound train to Bay Parkway or 8th Avenue and transfer to a Coney Island-bound train. Until the spring, trains will skip 30th Avenue and 36th Avenue in Astoria for station repair work. Riders can use nearby stations or local buses including the Q102, Q18, Q66 and Q69 for alternative service. Trains will skip Prospect Avenue in both directions through the fall. Trains will run local in Brooklyn from 59th Street to Atlantic Avenue-Barclays Center from 11:45 p.m. Friday to 6 a.m. Monday. Astoria-bound trains will skip 39th Avenue and Broadway from 11:45 p.m. Friday to 5 a.m. Monday. Coney Island-bound trains will stop at 45th Street and 53rd Street in Brooklyn from 12:01 a.m. Saturday to 5 a.m. Monday. Q Train: Service will be suspended in both directions between Coney Island-Stillwell Avenue and Brighton Beach from 4:45 a.m. Saturday to 10 p.m. Sunday. Free shuttle buses will provide alternate service. R Train: Service will be suspended in both directions between Bay Ridge-95th Street and 36th Street in Brooklyn from 11:45 p.m. Friday to 5 a.m. Monday. Free shuttle buses will provide alternate service.